What is a Panda Dog? Queen Elizabeth Panda Dogs are typically black and white, but many are red and white. 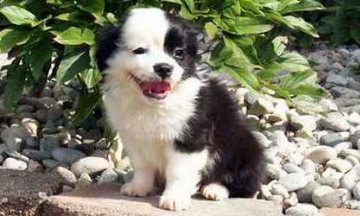 They are a toy [companion] breed with a plush short to medium length coat resembling a panda bear pattern. 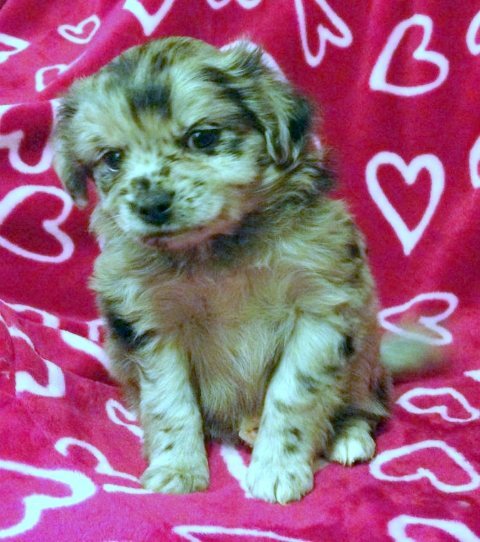 They can be solid, pied, tri-color, brindle or jester [harlequin] in pattern. Some even have beautiful blue eyes! 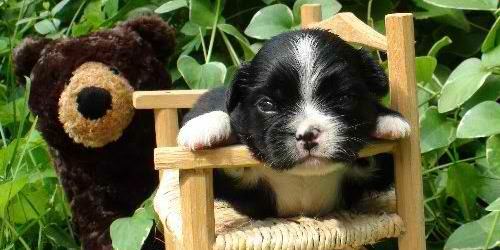 The Panda Dog can be as small as 5 lbs. or as large as 18 lb. Most are around 12 lbs. Their coat is unique as it does not require much grooming. It does not typically tangle, or require trimming, easy care making them suitable as therapy dogs. This type of fur sheds the dirt and pollen so they seldom need bathing. No dog is truly hypoallergenic, but this breed has proven to be a good choice for most families and about as close as it come to allergen free. This variation of toy bulldog breed is still in development but we are making wonderful pets along the way. Their temperaments can't be beat. Sweet and calm when you want to snuggle, they're ready to romp and rough-house when the kids call. Queen Elizabeth Panda Dogs have good endurance, no breathing problems or particular sensitivity to heat. They do not have joint disorders or any known genetic problems. The Pandiebears have been bred from other Pandiebears for enough generations that they are their own breed: Queen Elizabeth Pocket Pandiebears. Originally they were started by blending Queen Elizabeth Pocket Beagles with about a dozen toy breeds. This was done as a club activity for 15 years. 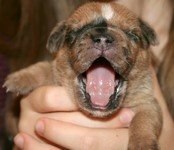 Breeders all around the nation contributed their best results and puppies were shipped nationwide until the right look and temperament was achieved by cross breeding. 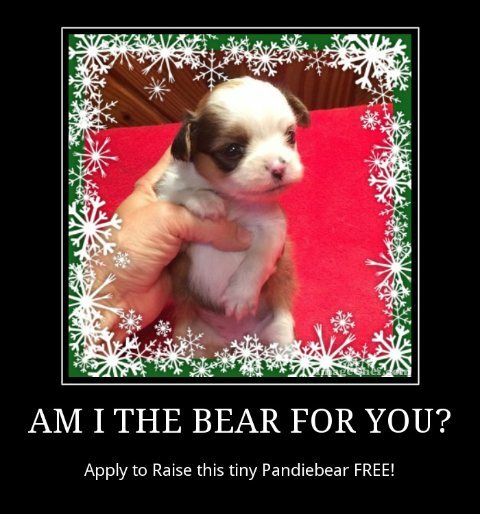 So this is not a simple hybrid like a Puggle: mixing pug and beagle. It is far beyond introducing new purebreds into it. Pandiebears are bred to Pandiebears... to make more Pandiebears. But on our shipping label we say beagle mix to satisfy the airlines as they don't know what a Pandiebear is! We can't divulge the exact begininngs because we do not want our competitors to duplicate what we did. But, what it is NOT, we can give you this clue. 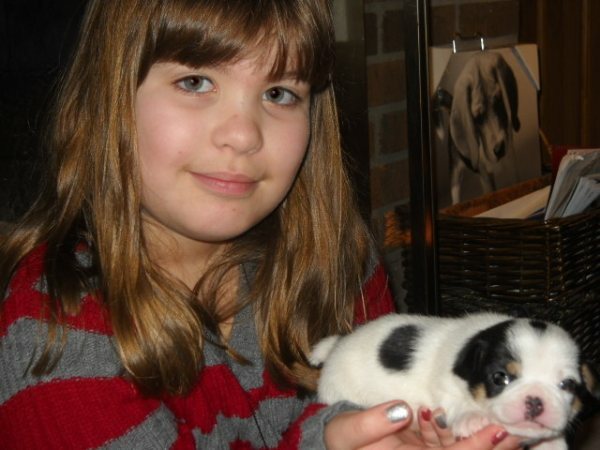 It is not the common Shih Tzu mix or even Lhasa Apso or Maltese or Yorkie. Those breeds have problems with fur getting dirty and growing too long and hard to maintain. The Pandiebear has wonderful hair that is self-limiting in length. So in addtion to having an especially sweet nature, we can't reccomend another small black and white breed that is easier to care for! And we give a one year health warranty. Panda Dogs represent more than ten years of complex breeding. All puppies produced were evaluated to have good health. Some dogs are marked almost like the panda bear they are named after. They are easy to care for with a dazzling white coat that does not show dirt. These puppies will also make great therapy dogs. They are not a nervous breed and they love the energy of children. But they are calm and like to spend most of their time next to you. Adorable Red & White or Blue Pandiebears!